The SCAPE Public Art Christchurch Biennial in 2015 will present seven new site-specific public art works in Christchurch as well as two public participation projects. The SCAPE 8 Public Art Christchurch Biennial is a contemporary art event, which mixes new artworks with existing legacy pieces, an education program, and a public program of events. The SCAPE 8 artworks will be located around central Christchurch and linked via a public art walkway. SCAPE 8 will see the installation of one major legacy/permanent public artwork for Christchurch. This legacy artwork, backed by the Christchurch City Council Public Art Advisory Group and Canterbury Earthquake Recovery Authority (CERA), will be that of renowned British sculptor, Antony Gormley. The title for the 2015 Biennial – New Intimacies – comes from the idea that visually striking and emotionally engaging public art works can create new connections between people and places. Under the main theme of New Intimacies there are three other themes that artists will respond to: Sight-Lines, Inner Depths and Shared Strengths. Site-Lines engages with the changed landscape of the city centre, with its new vistas opened up across city blocks, out to the Port Hills and beyond. Artists have been invited to consider how the city’s new spatial character has the potential to stimulate fresh thinking. #ThatTimeYouHelped – Our Portraits of People Reaching Out to One Another, invites locals to create photo-portraits of “a person who has helped you or others” and to upload them to an online gallery. For those who want to gain some new skills or insights, there will also be a series of free Saturday workshops during SCAPE 8 – The ‘How-To’ Guide to Making Portraits – which will be run by members of the local creative sector. A call-out to Christchurch’s creative sector for workshop proposals was released at last night’s launch. 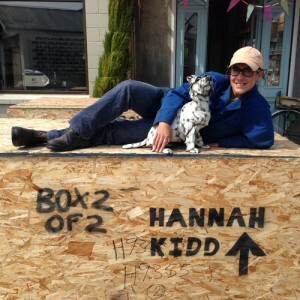 Image: Hannah Kidd; photo courtesy of the artist.